A Guide to Closed-End Funds: What are the features of closed-end funds? How do they calculate the value of their portfolios? This guide answers these questions and more. Frequently Asked Questions About Closed-End Funds and Their Use of Leverage: These FAQs delve into “leveraging,” the practice whereby a closed-end fund raises additional capital, which it can use to buy more securities for its portfolio. This strategy is intended to allow the fund to produce higher returns for its common shareholders over the long term. Don’t forget ICI’s recent report on closed-end funds, which goes into detail on the closed-end fund market, the funds themselves, and the characteristics of their investors. 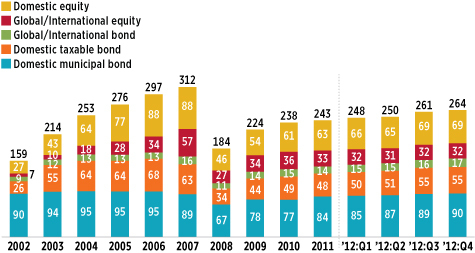 As the report indicates, total closed-end fund assets were $264 billion at year-end 2012, up 9 percent from year-end 2011. Note: Components may not add to the total because of rounding. Data reflect revisions to previously reported data. Visit our Closed-End Fund Resource Center to find the report and other useful information. Daniel Schrass is an associate economist at ICI.